Designed and constructed with taller riders in mind. No more hunching over, the A6 features handlebars that adjust to an incredible 42” (1067 mm). Features new, patent-pending, anti-rattle technology. Awesome scooterThis scooter is awesome, the big wheels, the stability, the handle bar, perfect for tall riders, I am 6.3ft and weight 200 lbs and ride with ease on this scooter, great product. Great short commute scooter, but fun too!I got one of each color of this scooter. It's been great to have around, to just ride to the coffee shop, or pharmacy real quick. 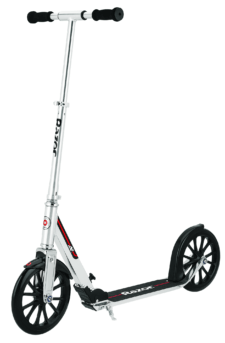 Over the holidays, my relatives and friends(grown men) had a blast racing each other and trying to do tricks on these scooters. It was super funny to watch, but the scooters held up quite nicely to all the wear and tear.